You might recollect an excellent note taking service by a group MIT alumni – WebNotes. The same people now bring us another cool web service to help collaborate on documents online easily. It is incredible that you can easily upload and share documents with your peers or friends online for free without even having to create an account. 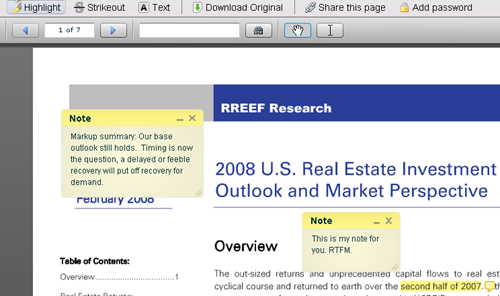 You can create Sticky notes in the document, highlight and do some additions, etc. Check out the demo here to give it a whirl. Corocodoc Pro account costs $8/month or $36 year. But, you can start using the free Crocodoc without even creating an account right now. Sharing and Collaborating with Google Documents might suit for most people but Crocodoc offers some nice collaboration features missing in Google Docs. If you have used Webnotes, you will feel right at home with Crocodoc as well.